Our customer care team is here to answer any questions for you. SEO SpyGlass has a number of metrics and aspects that you can analyze for the backlinks, to determine their quiality and value in terms of SEO. Inlink Rank is based off the same algorithm as the original Google PageRank and is determined by the number and weight of incoming links to a page. It's a score on a logarithmic scale from 0 and 100. In your SEO SpyGlass project, you can check and analyze InLink Rank of any backlink pages, as well as Domain InLink Rank of the domains the links come from. 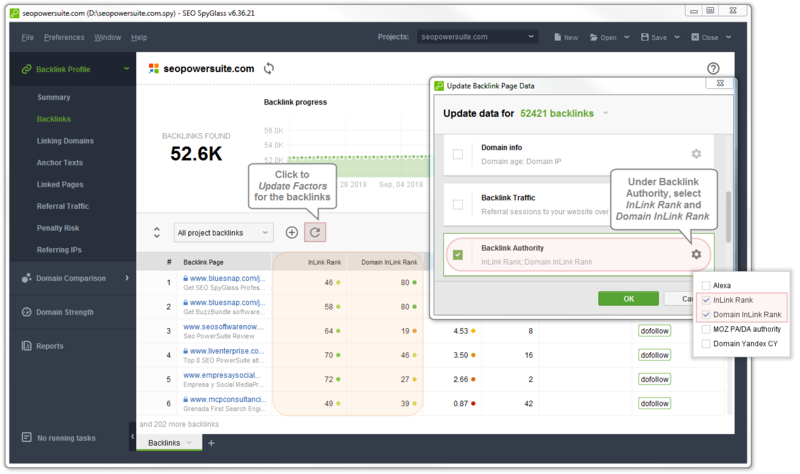 To check the factors, select the backlinks in your workspace under Backlink Profile > Backlinks, click the Update Backlinks button and select InLink Rank and Domain InLink Rank under Backlink Authority. If you don't have the respective columns to display the results, you can add them by editing the current workspace. Link Value is another metric calculated by our own private formula. It's an estimation of the SEO value of the selected backlink. The formula is based on the number of external links on the backlink page, and page's InLink Rank, and estimates how much link juice is likely to be transmitted through given backlink. Link Value is being calculated automatically once those two involved factors are checked. 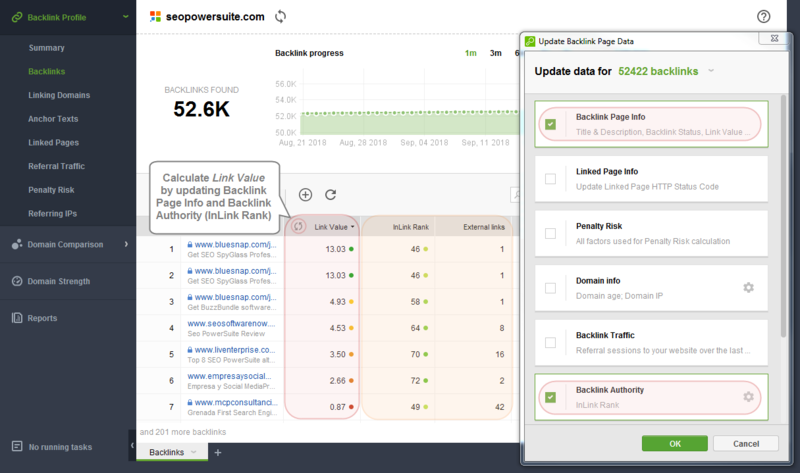 But you can update it anytime from the column header: SEO SpyGlass will automatically select the set of factors that need to be checked (Backlink Page Info and InLink Rank). In the Link Value column, you will see the relational values with color indicators from red to green, where red indicates relatively low value and green means a link is valuable in terms of SEO. When it comes to backlink profile on the whole, it's important that it looks organic and diverse, and grows at a natural pace. To be on a safe side, you can turn to Summary module to keep an eye on the backlink profile growth tendencies, linking domains destribution across countries and IPs, backlinks destribution across linked pages of your site, and anchor details diversity. For more detailed statistics on each aspect, you can revise the Anchor Texts, Linked Pages or Referring IPs modules directly.